Will salmon take a dry fly in saltwater? This is one of the saltwater salmon fly fishing questions that has plagued me for many years. My experiences tell me that there are patterns possible. Now, are current fly fishers up to the challenge to discover them. Historically fly fishers seemed to have balked at this challenge. We have writings published near the turn of the last century which speak of salmon fly fishing in salt waters yet, today, almost 100 years later we are still in a pioneer state with salmon saltwater fly fishing. Over the years I have seen a variety of situations where feeding salmon have taken surface shrimp and surface skittering escaping herring. That they will come to the surface to take feed does make me feel that there is a probable dry fly which has yet to be created. But, the ocean surface is much different than fresh water stillwaters. I have found that it has a fine oily film which makes it almost impossible to keep a fly on the surface. Cleaning and drying the fly is a much repeated process. The ocean is also much clearer than most lakes or streams and any false action seems to immediately spook salmon. But, I have hooked salmon on the surface, and share the following in the hopes that readers have solutions and patterns. 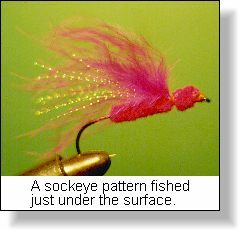 Some years ago, when I was experimenting with an infinite variety of patterns (I still do), I found one that surprisingly took bluebacks and even coho on the surface. It was a chance happening as are most successes when saltwater fly fishing for salmon. But, it pointed towards a new possibility when fly fishing for these very active and very challenging fish. On that trip I had been working with a variety of modifications of the Pink Eve and had, just because the materials were visible on my fly tying table (I confess there are normally many materials visible on my fly tying table), put together a flaming red concoction, palmer tied to help it remain on the surface. My wife has never forgiven me for dubbing it the "Flaming Frances", but, wonders never cease, it worked! Yes, the coho bluebacks, who were about three pounds at that time, slurped it from the surface just as I have seen Interior rainbows slurp large sedge flies during an evening hatch. The secret seemed to lie in the ever so slow twitched retrieve that I used. I would cast the fly to a location where there was a surfacing blueback school and simply let the fly sit on the surface. Periodically I would twitch the fly almost like a slow chironomid twitch with a strike indicator. The salmon take, when it came, was simply a slurp of the fly from the surface. I have used this on a number of occasions when I have found surface feeding bluebacks and feel that I now have one successful pattern. Unfortunately, it is limited to 'pink' feeding young coho who work on the surface only during mid spring. 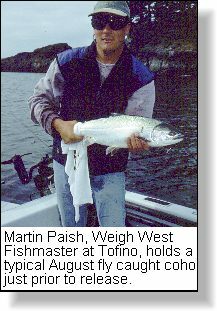 In some summer situations I have seen a single yearly herring skittering just under the surface in a panic stricken manner only to be snatched by a pursuing coho or chinook. This is another situation that I feel warrants dry fly experimentation. I have been successful luring that salmon to my fly when I have cast to the window of action. But, I know that this is simply chance. I was in the right place at the right time. But, the fact that they would take from the surface has convinced me that there must be a pattern which can be used. A few years ago my partner and I were fly fishing for bluebacks during late winter in Johnstone Strait waters. This was surface fly fishing as anyone who has faced Johnstone Strait tides realizes. In one small bay we found surfacing bluebacks but they refused every pattern until we used a hook sized #6 Silver Thorn tied on a Mustad 34011 hook. Bingo! When we stripped the fly just under the surface we hooked salmon. While the action was not fast and furious, it was consistent and we boated and released a number of these spunky saltwater sports fish. That experience, and others which have been similar, has resulted in my carrying a complete dry line outfit, threaded and ready for surfacing schools of salmon that I find when I am salmon hunting. While this is not a dry fly it rides just under the surface on the retrieve and does hook salmon. Is it possible to tie a 'silver' pattern that will skate on the surface for these fish? I continue to tie a number of these and look forward to experimenting with them. 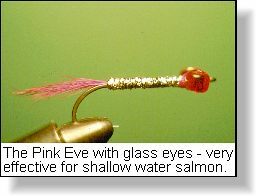 Many autumn estuary salmon fly fishers have perfected a high skating fly which they call the pink polliwog. It is tied with hollow winter deer hair to keep it riding high. After tying, the pink hair is trimmed to make a round (polliwog) shape with a long tail. However, the salmon being targeted are those in estuaries ready to move upstream when the hereditary spawning urge strikes. 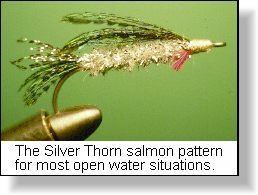 I have tried small version on pink salmon in beach-estuary locations and have had strikes on this pattern. 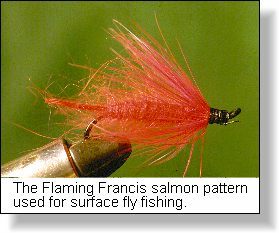 I have also seen very small #14 sized pink flies fished just under the surface using floating fly lines. These have also produced fish. Saltwater fly fishing for Pacific salmon is still in a pioneer stage. This is the time to visualize those salmon surface takes and to experiment with unorthodox dry fly patterns. 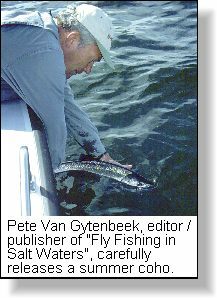 I would be interested to hear from readers what experiences they have had with surface feeding salmon and, if they have yet found that elusive saltwater dry fly for open ocean feeding salmon.